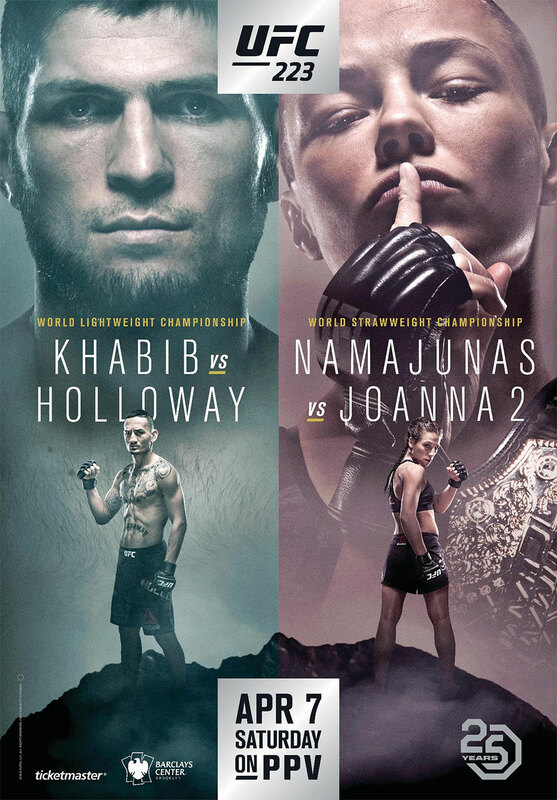 “UFC 223: Khabib vs. Iaquinta” goes down Saturday night inside Barclays Center in Brooklyn, New York. Fox Sports 1 airs the preliminary bouts live starting at 8PM ET/5PM PT. The pay-per-view broadcast begins immediately after at 10PM ET/7PM PT. Tonight wraps up arguably the most chaotic week in MMA history. Between interim lightweight champion Tony Ferguson abruptly pulling out of the main event against Khabib Nurmagomedov, featherweight champ Max Holloway agreeing to step in on just six days’ notice, then exiting one day before showtime due to weight cutting issues, and of course the whole Conor McGregor fiasco which resulted in three bouts in the lineup being nixed. The UFC certainly took the scenic route, but at least we are finally here. Nurmagomedov now fights Al Iaquinta for the vacant lightweight title in the main attraction. Rose Namajunas defends her strawweight belt against Joanna Jedrzejczyk in the co-main event.